Hello Sunnyside families! Read-A-Thon 2018 was an enormous success. We surpassed our fundraising goal. Our total so far is over $34,000! 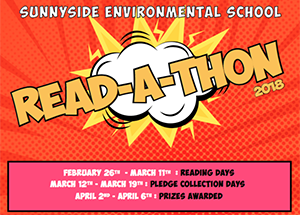 If you still have pledges to collect, please do so and bring them to the main office. We are still accepting donations. Congratulations to all the winners, but also to each and every one of our students and parents for putting in so much work and dedication into making this fundraiser such a big success for our beloved school. We all win with Read-a-thon. To all the volunteers who helped me organize the event, come up with amazing ideas, design the reading logs, decorate the school hallway, secure authors to visit, catch kids reading, count money and so much more, you are all AMAZING. And finally a most special thanks to Leslie Lothamer, parent volunteer extraordinaire, and Gillian Grimm, the best librarian any school cold ever hope for! We will be bringing prizes to the students and classrooms within the next week or so. Please be patient; we will take care of everyone.